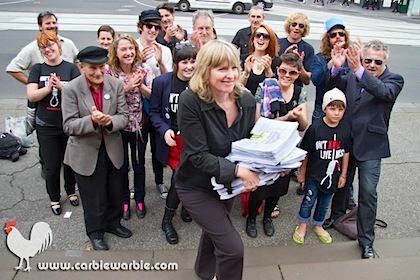 Yesterday a group of musicians spanning many generations handed Greens arts spokeswoman Sue Pennicuik a petition signed by 22,000 people, which asks the Government to remove the link between live music and high-risk liquor licence conditions. Ms Pennicuik (the other Sue) will present it to the Parliament next week. Over 20,000 Victorians demand that ‘high-risk’ conditions be de-linked from live music. Since the closure of The Tote Hotel in mid-January, the Fair Go 4 Live Music petition has been collecting signatures from music lovers all around Victoria, calling on the State Government to overturn the link between live music and ‘high risk’ conditions on liquor licenses for live music venues. Melbourne’s musicians and music lovers marched through the city streets for the SLAM Rally on February 23rd and it’s time to return to the steps of Parliament with the delivery of the petition to the Legislative Council on Wednesday April 7th 2010 by various decades of well-known Victorian musicians. Despite the signing of the Live Music Accord with the State Government, the link between live music and ‘high risk’ still exists. More disturbingly, no venues have had their high risk conditions removed since the signing of the Accord. The music industry and the public want to see real action on this issue. We want action, not just Accords. The threat to Victoria’s vibrant live music culture remains in place. The 22,000 signatures attest to the public support of live music. SLAM, FG4LM and Music Victoria will redouble their efforts to bring this issue to the attention of the public. At the end of March I put up a new page on this website… Remove Sue campaign. There has now been word the Government are restructuring arrangements for liquor licensing, but it's still possible MacLellan may remain in her role for another year, and every week that goes by with her in charge, more damage is done to music venues and the music industry. Please consider campaigning in some way to make sure she is removed from her position as soon as possible. I've now set up a Facebook page… Music Doesn't Make You Violent, to help publicise this website and the issues. Please fan yourself! I've also added an Articles and letters section to the website, primarily for writing not published elsewhere online. There's one article so far, by the Reverend Canon John Fowler, about how our pubs are essential training grounds for musicians: Pubs Give ‘Live’ Line to Local Bands. Please drop me a line if you would like me to publish an article or letter for you. Two other great articles have appeared. One is Labor's HOT Seats can save Live Music's Universities, by Martin Cooper. It includes a moving description of a music session at the Lomond Hotel, where both kids and adults learned from experienced musos. The other is in the March AudioTechnolgy magazine (no 73), page 32: Live music shall overcome… someday. It concludes by saying to sound engineers: "Remember, it's very difficult to master the art of a live mix if there are no venues to practise in".